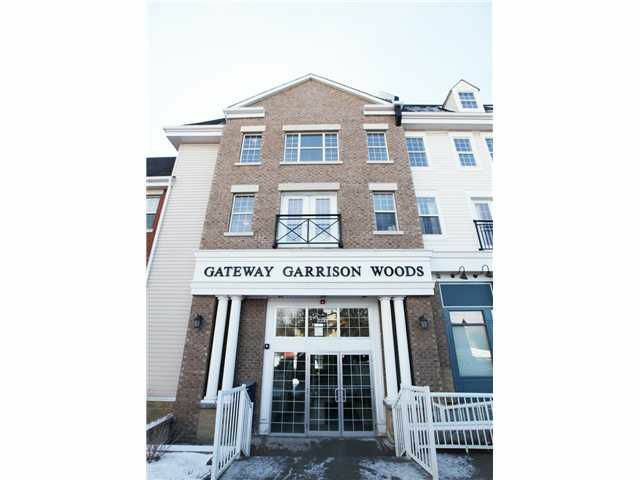 UTIFUL TOP FLOOR LOFT located in the AWARD WINNING COMMUNITY of GARRISON WOODS! This one bedroom, one and a half bath, features an OPEN plan that INCLUDES a stylish and FUNCTIONAL ISLAND with seating, offering a clean and elegant look with a SPACIOUS kitchen, STAINLESS STEEL appliances and an abundance of cabinetry! The BRIGHT living room, with floor to vaulted-ceiling windows and a COZY electric FIREPLACE, walks out to a large, COURTYARD FACING balcony, large enough for your BBQ and furniture! PERFECT for entertaining, your family and friends will be impressed! The LOFT offers a UNIQUE master bedroom, a large walk-in closet, full size washer and dryer and a 4 piece bathroom. All of this with TITLED underground PARKING, a STORAGE locker, AND condo fees that INCLUDE EVERYTHING except cable and internet! Call your favorite Realtor to view! !